A gold IRA is an individual retirement account backed by gold or a mix of additional precious metals, such as silver, platinum and palladium. ➜ Why should I invest in a gold IRA? ➜ What are the advantages of a gold IRA? Over the last few years, precious metals have become an increasingly popular investment option for those who want to protect their life savings from the volatility of other markets. Investing in gold for retirement is not a new concept. But as millions of Americans saw their retirement accounts plummet during the economic downturn, more and more people are discovering the many advantages of a gold IRA account. Frustrated with how quickly your retirement funds can be washed away by numerous external economic factors? Tired of the unpredictable nature of stocks, mutual funds and bonds? Worried about the declining value of the U.S. dollar and how it will hurt your purchasing power in the future? Sick of riding the roller coaster of other markets and investments that you thought were “stable”? Concerned you won’t be able to retire as early as you wished, or that you won’t be able to keep the lifestyle that you have today? These are all valid concerns to have, especially in today’s economy. And, as more economic uncertainty looms over the next few decades, many Americans are taking action to secure their financial future with gold investments. Use the information below as a quick guide to precious metals IRAs and their benefits. Each person’s situation is unique, so be sure to speak to a knowledgeable precious metals specialist who can help you determine which investment option is right for you. Between 2001 and 2011 – just 10 years – the U.S. dollar lost nearly 28% of its purchasing power. As the recession unfolded, the values of stocks, bonds and real estate tanked. All of this had an extremely detrimental effect on many Americans’ retirement accounts. Even today, many people who were hit hard by the economic downturn are forced to work past their retirement age. Others who had hoped to preserve their wealth and leave a sizable nest egg for their families have been forced to make tough decisions as their net worth was eaten away. However, those who invested heavily in gold during this same time period saw their wealth rise dramatically. Let’s take a look at why, and how, your financial situation could benefit from a gold IRA. Any financial advisor will tell you that a well balanced portfolio is the key to long-term growth. Putting all your money into the stock market – even if it’s in low-risk mutual funds – is the equivalent of putting all your eggs in one big paper basket. None of your investments are safe when the market gets bumpy. By investing in gold and precious metals, you are not only diversifying your portfolio, but also adding stability. Not only that, the same economic uncertainty that weakens stocks generally increases the value of gold. This is what makes a gold IRA a smart choice for those who want to safeguard their retirement and preserve their wealth at the same time. Over the years, gold has steadily increased in value, while the dollar has declined. In fact, when the U.S. government prints more money, these measures increase the value of gold. Why? Because you can’t simply “print” more gold. It’s a finite resource, and thus an investment that hedges against inflation. A lot of questions still surround the U.S. dollar, and many economists expect it to continue its decline. Investing in a gold IRA gives you peace of mind knowing that your future purchasing power isn’t dependent solely upon uncertain paper assets. Even as the price of gold has hit historic highs over the last few years, many expect the value to continue its climb well into the future. If you’re serious about planning for your future, now is the time to consider a gold IRA. Precious metals IRAs are approved by the federal government, so you can enjoy all of the tax benefits of a traditional account – without all of the stress and uncertainty. If you have a 401(k) from a previous employer, it can be easily converted into a gold-backed IRA. Or, if you have a Traditional IRA or Roth IRA, you can transfer all or a portion of it into a gold IRA. 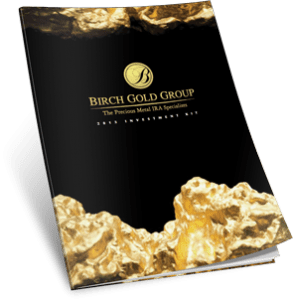 With the help of Birch Gold Group, it only takes one quick phone call to learn more about precious metals IRAs and how they fit into your retirement planning. 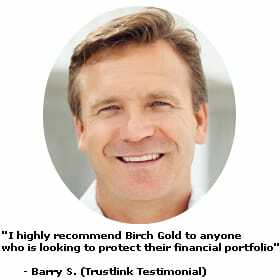 Birch Gold Group is a leading precious metals company, rated A+ by the Better Business Bureau. Our skilled specialists will listen to your goals, answer your questions, and inform you about your options – with no high pressure sales pitch. Whether you decide to choose a retirement account, gold coins, bullion or other precious metal options, we will make the process simple and enjoyable. Contact us today for more information by filling out the form on this page or by calling us to speak with one of our precious metals advisors. Call us at (800)355-2116 or fill out the form on this page for more information on gold-backed IRAs.